There’s something reassuring about watching a black and white horror. Not in the sense that you’re guaranteed a good view but just that in watching one, one is thrown back to their younger days when on a Friday night on BBC2, a crackly old horror print was put on for an apparently captive audience. Watching She Wolf of London bought back all those affectionate memories of watching such tame dated fare. And tame is very much the buzz word here with little in the way of atmosphere or shocks, even badly dated ones. In fact a genre audience could possibly be quite put out by it. With its title promising werewolf shenanigans, many would feel cheated to discover that in fact this is more a whodunit than a furry beast picture. In fact no such beast is ever glimpsed with the matter being more back-story for someone to try and fiddle another out of their inheritance than the promise of people being ripped apart under a full moon. 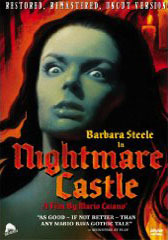 Released as part of a double-bill with The Cat Creeps, (1946) the movie took on the less deceiving title of The Curse of Allenbys for its UK release. It was released in the same week as Devil Bat’s Daughter (1946) which had a very similar plot where a naïve girl is led to believe that she is a vampire, rather than a werewolf. 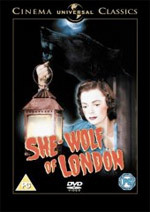 Indeed many at the time considered that it may be a belated follow-up to Werewolf of London (1935) given the mention of ‘wolf’ and ‘London’ in both titles. 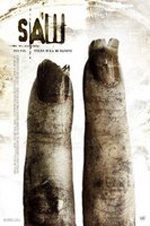 This led to a general dismissal of the movie for masquerading as something it evidently was not. Based on the novel by Dwight V. Babcock, She-Wolf of London makes for an ok watch one wet Sunday afternoon but still feels at least half-an-hour longer than it’s very short 61 minutes running time. George Bricker’s screenplay feels repetitive and it doesn’t help that despite some well sketched characterisations that many of the peripheral characters can’t act for toffee and appear to have forgotten that the movie is based in London, especially those playing the police. It’s just as well as there is no intentional humour to brighten up proceedings. Of the cast you may recognise June Lockhart as the possible She-Wolf Phyllis Allenby. She played the mum in TV’s Lost in Space. Filmed in just two weeks, director Jean Yarbrough’s feature is light on production features ensuring that most are shrouded in a dense fog to hide the limitations of their sets. That dense fog comes in handy, ensuring that some of the scenes do have some atmosphere as bumbling people still venture into the public park that the murders are taking place. Watchable, adequate, obvious and unspectacular She Wolf of London makes for a nice Sunday afternoon filler but will leave you wanting for more.